One of my favourite albums of late is the new solo album by Satori (of El Mundo & Satori fame) on the Dutch techno label Bla Bla. In fact, we were so excited by the sound of this album that we invited Satori to perform his new live-set at our upcoming event Midnight Wonderland. To spread our excitement and to make sure the room is packed when he takes the stage, I interviewed Satori about his inspirations, Zen moments and the live jam session with keys that he will perform at Midnight Wonderland. To start off easy, who is Satori, what does he do, and what does he sound like? You’ve had quite some success as a duo with El Mundo. Why did you embark on a solo project? Where do you get your inspiration for your solo work from? Can you define the sound and vibe of Satori in one or two songs that influenced you? Now that you’ve released your solo album Into Void, what’s your next BIG goal/ambition? If you could invite any DJ or producer in the world to work together with, who would that be? Any upcoming DJ/producers we should start looking out for? You’ll be playing at our event Midnight Wonderland, are you looking forward to this? Can you tell us little bit more about your live set-up? What is going to happen in your set? Curious yet? 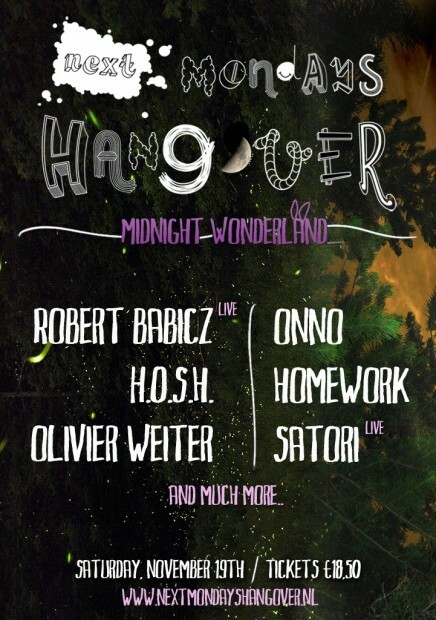 I’ll see you up front during Satori’s set at Midnight Wonderland. For those without a ticket (it’s sold out), there will be 200 tickets at the door from 22:00.